50 percent bonus expensing allows all businesses to immediately deduct (expense) half of their investment in equipment and software, unlike the current depreciation system that delays these deductions for years or decades. Bonus expensing represents an important step toward full expensing, which economists recognize to be ideal for investment and economic growth. We find that extending 50 percent bonus expensing on a permanent basis would boost GDP by over 1 percent, the capital stock by over 3 percent, wages by about 1 percent, and would create 212,000 jobs. These benefits go primarily to workers with low incomes due to higher productivity, higher wages, and more jobs. Due to the growth in wages and incomes, total federal tax revenue would increase by about $23 billion per year. Congress is currently debating the tax extenders bill, which is a set of about fifty tax provisions that routinely expire and are then renewed again on a temporary basis. The tax extenders expired at the end of last year, and the Senate Finance Committee has proposed renewing nearly all of them retroactively to the beginning of this year and through 2015. Many of the items in the bill reduce taxes on business production, such as the research and experimentation tax credit, while others reduce individual taxes, such as the deduction for state and local sales tax. Some of the items only apply to certain industries, such as the mine rescue team training credit, and as such can be thought of as special interest loopholes. In contrast to many extenders that apply narrowly or are disguised government spending programs, bonus expensing, also known as bonus depreciation, is broadly applicable and has the additional benefit of allowing businesses to more accurately report their incomes. These aspects, combined with its powerful growth effects, makes bonus expensing the most helpful tax extender. Bonus expensing allows all businesses to immediately deduct a portion of investment expenses instead of the usual treatment that requires businesses to delay these deductions for years or decades based on a complicated system of depreciation by asset and industry. In the current proposal before Congress, bonus expensing would allow 50 percent of investment in equipment and software to be deducted immediately (expensed), with the remainder to be deducted in the usual manner. Investment in structures or anything that is currently written off over more than twenty years would not get bonus expensing. Nonetheless, some critics see bonus expensing as a corporate giveaway that increases the deficit. It is not. It corrects an undercounting of the cost of equipment inherent in the long-delayed tax write-offs. Others argue that bonus expensing is more effective as a temporary stimulus, but in fact, the temporary nature of it introduces uncertainty and unreliability, reducing the potential positive investment incentives if the provision permanently lowered the cost of equipment. Over the years, Congress has been conflicted about the merits of bonus expensing, which may explain why it is often passed on a temporary basis. Part of the problem is that Congress is being misinformed about the budgetary costs, because the official congressional scorekeepers rely on static analysis that explicitly ignores any economic benefits. Were Congress to use better information about the long-run economic and budgetary effects of bonus expensing, it would be more inclined to extend it on a permanent basis. We provide here the results from modeling a permanent extension of 50 percent bonus expensing. Using our Taxes and Growth Model to trace the dynamic effects of such a policy on the economy and the budget over the long run, we find that 50 percent bonus expensing would grow GDP by over 1 percent, the capital stock by over 3 percent, wages by about 1 percent, and would create about 212,000 jobs. These benefits go primarily to those with low incomes; the after-tax income of those earning less than $40,000 grows more than 1 percent while the after-tax income of those earning more than $40,000 grows less than 1 percent. This is because boosting the capital stock makes workers more productive and they are paid accordingly. Additionally, companies hire more workers to man the new machines. The rich get a more temporary boost in capital income that is competed away over time, in accordance with historical data indicating a fairly stable after-tax rate of return on capital. Ultimately, wage earners are the big winners. The federal budget benefits as well. Since most federal tax revenue comes from taxes on personal income and payroll, growth in incomes would translate into an increase in tax revenue of about $23 billion per year. The static revenue loss of $18 billion per year is completely offset by the growth benefits. These results are shown in Table 1. In sum, enactment of permanent bonus expensing would reduce the deficit in the best way possible: through job creation and broadly shared prosperity. A one-year extension of bonus depreciation costs about $5 billion ($9 billion with interest), since the upfront costs are mostly offset with savings in later years as businesses are no longer writing off the cost of equipment. But a permanent extension would cost $300 billion ($380 billion with interest), 40 to 60 times as much as a one-year extension. If policymakers intend to make bonus depreciation a more permanent part of the tax code, they need to weigh the benefits against this steep cost. In theory, bonus depreciation encourages upfront business investment, since it allows businesses to write off half the cost of a new purchase immediately, rather than deducting it over time. However, many experts argue that that bonus depreciation is a fairly ineffective form of stimulus. For example, Mark Zandi estimates it will only providing 25 cents of economic actively for every $1 of cost, while CBO’s central estimate is only about 50 cents. Moreover, even if bonus depreciation is effective stimulus for a weak economy, there is a case it may no longer be needed at this point in the recovery. Recent Census Bureau figures show that business investment climbed to $1.4 trillion in 2012, exceeding the pre-recession high set in 2008. There are many problems with CRFB’s analysis. First, their budget projections are static, assuming no economic effects of bonus expensing. That is, they assume away any possible benefit in terms of economic growth resulting in additional tax revenue. Second, the economic analyses they do cite, from Mark Zandi and the CBO, refer only to short-term Keynesian effects from various temporary stimulus measures and not to the long-run impact of permanent policy changes. Third, their argument that investment has returned to pre-recession levels, resulting in no need for tax relief, is not supported by the facts. When adjusting for inflation, the Census Bureau survey indicates capital expenditures are still below the levels of 2008, 2007, or 2006. 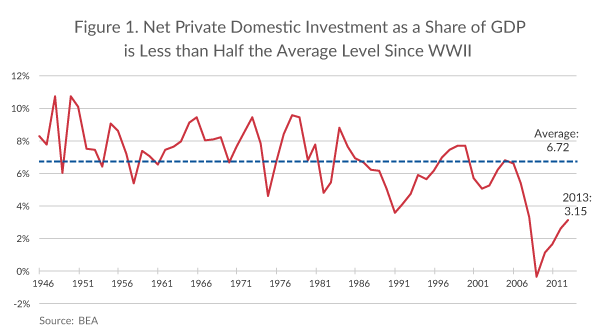 Broader measures indicate that although total private sector investment has rebounded somewhat from the depths of the financial crisis, it remains at less than half the pre-crisis peaks and less than half the average level since World War II (See Figure 1). Investment in the U.S. is also exceptionally low relative to that in most developed countries. Another mistake that CRFB and other critics of bonus expensing make is to think of it as simply a temporary stimulus measure. It should be seen as a way to permanently reduce the tax burden on investment, which has long-term benefits in terms of additional capital formation, higher productivity, higher wages, and more jobs. This is critical for an economy that suffers from extremely high taxes on investment, namely the highest corporate tax rate in the developed world, above average taxes on shareholders, and a depreciation system that is more punitive than those of most other developed countries. In our simulations, we find that moving to full expensing of 100 percent of investment for all types of assets, including structures, would boost GDP by about 5 percent once all adjustments are made, a process that will take roughly five to ten years. Bonus expensing moves toward full expensing but does not apply to assets normally depreciated over more than twenty years (e.g., structures) and in the current proposal is limited to 50 percent of the cost of equipment and software. The remaining cost of equipment and software would be written off according to the regular depreciation schedule, i.e., three to twenty years depending on the asset and industry. Due to these limitations, we find that a permanent move to 50 percent bonus expensing would grow GDP a little over 1 percent. Expanding the applicability of 50 percent bonus expensing to structures would roughly double the impact, and expanding it to 100 percent bonus expensing for all assets (full expensing) would double it again. The tax extenders cannot all be painted with the same brush. Many provisions clearly stand out as “special interest loopholes” that should be allowed to expire. On the other hand, some provisions in the extenders list have economic merit and deserve to be extended on a permanent basis. Some examples include Section 179 expensing for small business, the R&E credit, and active financing for banks. Like bonus expensing, they provide important investment incentives that make our tax code more neutral, more competitive, and more hospitable to innovative companies that employ millions of Americans. However, because of their limited applicability, these provisions may not be as beneficial to the overall economy as bonus expensing. Ultimately, the most beneficial tax extender is bonus expensing, which is broadly applicable and allows all businesses to immediately deduct half of their investments in equipment and software. The other half, and all other investment in structures, faces the normal depreciation system that requires businesses to delay their investment deductions for years or decades depending on the asset and the industry. Full expensing in the first year of investment is what most economists recognize to be ideal in terms of economic growth. Bonus expensing takes a big step in that direction. We find that extending 50 percent bonus expensing on a permanent basis would grow GDP over 1 percent, once all adjustments are made. It would grow the capital stock by over 3 percent, wages by about 1 percent, and create the equivalent of 212,000 full-time jobs. The economic benefits would accrue disproportionately to workers at the low end of the income scale, due to growth in productivity, jobs, and wages. The owners of capital would fairly quickly compete away their newfound profits, in accordance with a fairly stable after-tax return to capital. That is, the workers are the big beneficiaries. Further, because of the growth in wages and incomes, and the fact that most federal revenue comes from taxing wages and personal incomes, total federal revenue would increase by about $23 billion per year. Andrew Lundeen, Senate Finance Committee Passes $85 Billion Tax Extenders Bill, Tax Foundation Tax Policy Blog, Apr. 4, 2014, https://taxfoundation.org/blog/senate-finance-committee-passes-85-billion-tax-extenders-bill. Stephen J. Entin, The Tax Treatment of Capital Assets and Its Effect on Growth: Expensing, Depreciation, and the Concept of Cost Recovery in the Tax System, Tax Foundation Background Paper No. 67 (Apr. 24, 2013), https://taxfoundation.org/article-ns/tax-treatment-capital-assets-and-its-effect-growth-expensing-depreciation-and-concept-cost-recovery. The Committee for a Responsible Federal Budget, Paying the Costs of Bonus Depreciation, The Bottom Line blog, Mar. 24, 2014, http://crfb.org/blogs/paying-costs-bonus-depreciation (emphasis in original). See U.S. Census Bureau, Annual Capital Expenditures Survey, http://www.census.gov/econ/aces/historic_releases.html; U.S. Census Bureau, Capital Spending Report, http://www.census.gov/econ/aces/historic_releases.html. Inflation adjusting and other calculations were applied by the author to these two datasets. William McBride, How Tax Reform Can Address America’s Diminishing Investment and Economic Growth, Tax Foundation Fiscal Fact No. 395 (Sept. 23, 2013), https://taxfoundation.org/article/how-tax-reform-can-address-america-s-diminishing-investment-and-economic-growth. Kyle Pomerleau, The High Burden of State and Federal Capital Gains Tax Rates, Tax Foundation Fiscal Fact No. 414 (Feb. 11, 2014), https://taxfoundation.org/article/high-burden-state-and-federal-capital-gains-tax-rates; Kyle Pomerleau, The United States’ High Tax Burden on Personal Dividend Income, Tax Foundation Fiscal Fact No. 416 (Mar. 5, 2014), https://taxfoundation.org/article/united-states-high-tax-burden-personal-dividend-income. Kyle Pomerleau, Capital Cost Recovery across the OECD, Tax Foundation Fiscal Fact No. 402 (Nov. 19, 2013), https://taxfoundation.org/article/capital-cost-recovery-across-oecd. Some argue that full expensing should also be accompanied by a reduction of interest deductibility, so as to avoid subsidizing investment and properly tax consumption. However, a consumption tax that eliminates interest deductibility would also eliminate taxes on interest. For more, see Stephen J. Entin, Bring Back Bonus Expensing, Bring Back Jobs, Tax Foundation Tax Policy Blog, Apr. 18, 2014, https://taxfoundation.org/blog/bring-back-bonus-expensing-bring-back-jobs. Federal Reserve Bank of Minneapolis, Narayana Kocherlakota, Discussion of Robert Hall’s Paper, Apr. 12, 2014, http://www.minneapolisfed.org/news_events/pres/speech_display.cfm?id=5300&. Kyle Pomerleau, Tiberi Bill on Permanent Extension of Small Business Expensing, Tax Foundation Tax Policy Blog, Apr. 22, 2014, https://taxfoundation.org/blog/tiberi-bill-permanent-extension-small-business-expensing.